Happy Passover to You, Me, Kellogg’s, and the OU Too! When I bought this plastic bowl at the supermarket today, the label said: “Great for serving matzoh ball soup, charoset or salt water for the parsley at your Passover seder!” It wasn’t until I got home, opened up a new box of FrootLoops, and poured in the cereal that a light bulb went off and I keeled over in laughter. Hey, it was 5 boxes of FrootLoops for $5. What the heck would you have done!?! I should mail this picture to the OU* and give them a heart attack. Why spend the energy engaging in abstract ideological debate when you can just send a sweet picture like this one? B’teavon and Happy Passover Day 4, dear readers! May we all go from Redemption to Freedom in the coming year! 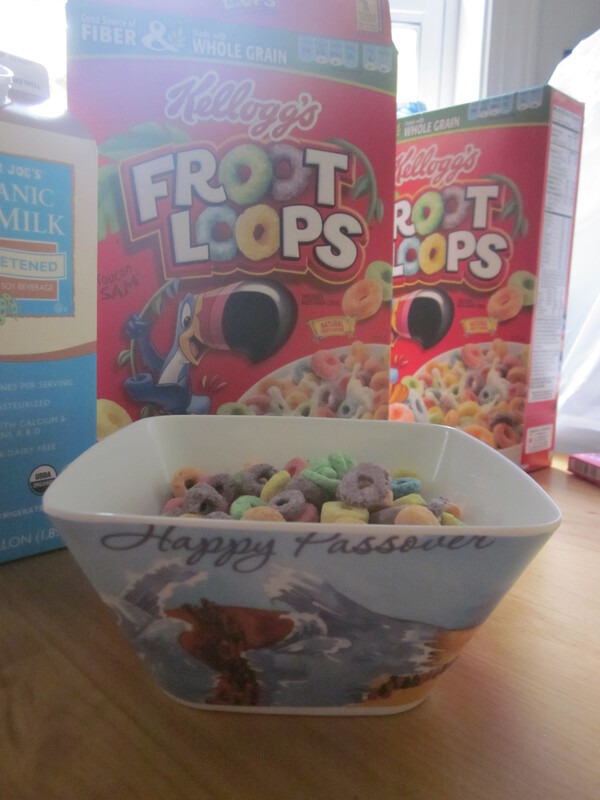 Rest assured that somewhere, someplace, there’s a population of Jews by whom Froot Loops are כשר לפסח. The trick is to find them, and join them.